Since today is my 38th birthday I thought it would be fitting to post some pictures of sleepovers through the years. Starting when I turned 11 I had one every year, although I may not have had one my Senior year, considering I found no photographic evidence of one. Regardless, here are a few year's worth of birthday slumber party goodness. 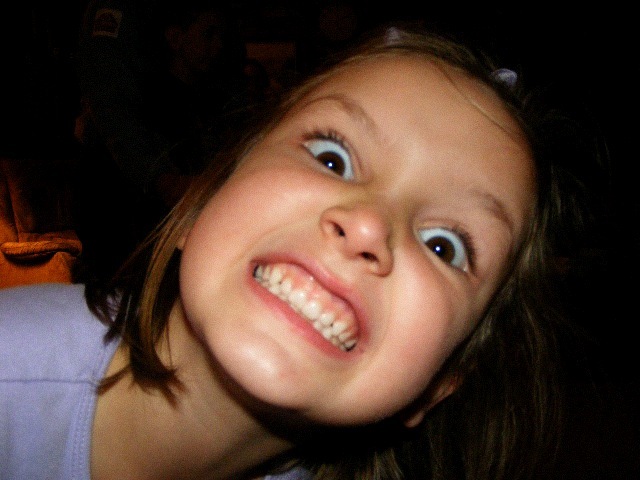 This was my 11th birthday. ﻿In case you hadn't figured it out, I was wearing a flannel nightgown. A. Flannel. Night. Gown. That was buttoned all the way up to my chin. And I had a mullet. 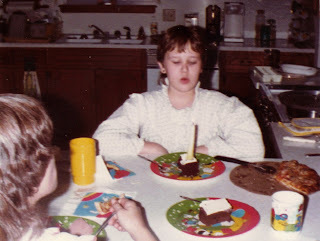 Also note the taper candle shoved into my cake. This totally looks like something I would do now that I am a mom. I guarantee you Mom had spent so much time cleaning house and running the PTO and being a Girl Scout leader she totally forgot to buy birthday candles. We also ate off Smurf plates left over from my sister's party the previous summer. My mom was and still is the coolest. This is DeLisa. She was 10 1/2. Yes, she is wearing a baby bonnet and has a bottle in her mouth. 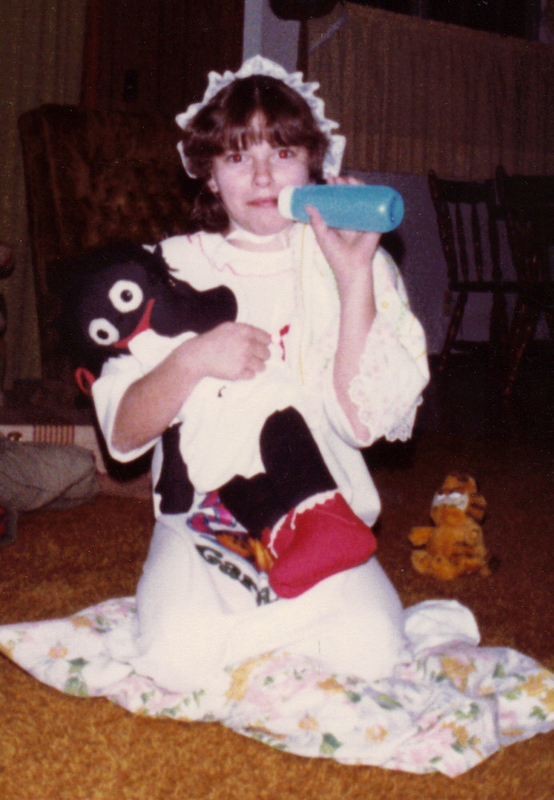 Apparently, we all were given the "special" birthday cake and got some wacky idea to drink soda pop "suicides" out of baby bottles, wear bonnets and carry around blankets and dolls. To this day I have no idea what prompted it, but it became a hard and fast tradition until we were probably Sophomores. I guess we abandoned it when we had all finally been kissed by boys. Thank God. This is Stacie and Necia at my 12th birthday party in 1985. Drinking out of baby bottles again. I'm also pretty sure that's the year we decided we needed more bottles and begged my Mom to take us to Walmart so we could buy more. This was also the fated trip that is still brought up by my mother when she decides to lay on the maternal guilt -- I asked her to sit in the car while we went in. I have tried to explain to her that it wasn't an embarrassment issue, it was simply that we were twelve years old and apparently thought going into Walmart alone was some huge rite of passage. Ahh...1986. 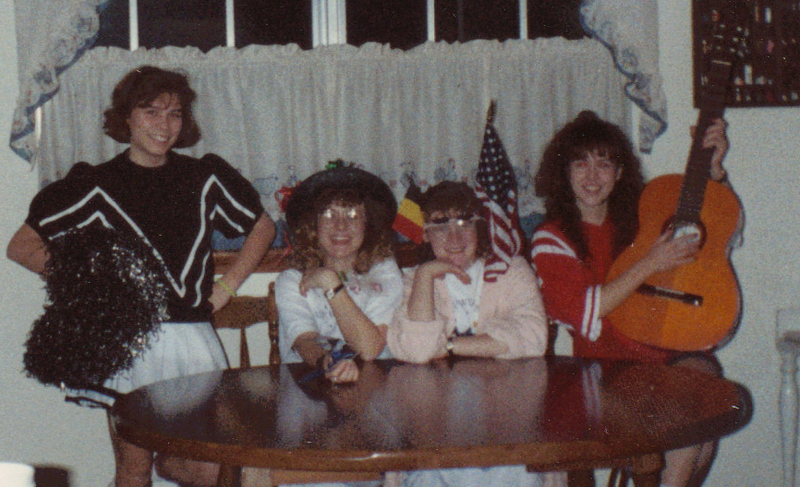 As you can see 1986 was obviously The Year of the Mullet, seeing as how three out of four of us in this picture had them. Chloe's (the blonde closest to the camera) was by far the most rockin' of all. However, I had some amazing "feathers" in mine. Perfect, feathery layers. Feathers that went down nearly to my chin on the sides. And when the wind blew they would blow up in layers that stood straight up. It was kickin'. There's nothing like sitting around the kitchen bar doing bottle shots with your homies. And note the 10lb bag of sugar in the middle of the bar. Apparently we were going to snort some later. 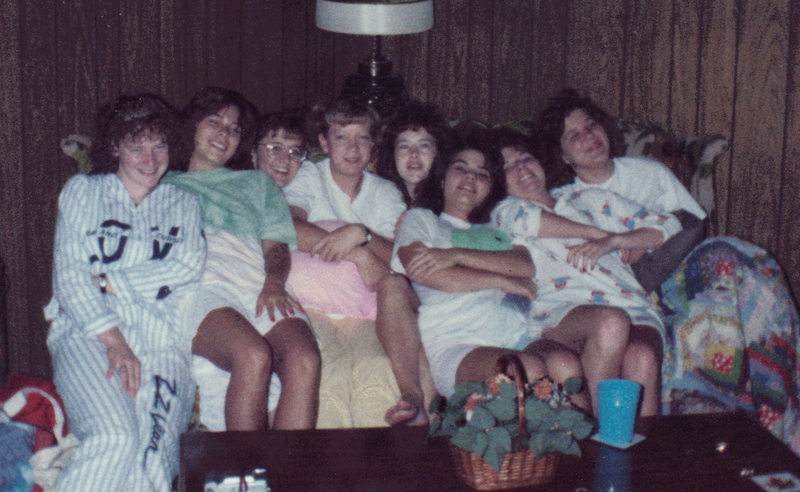 This was 1986, but this was not my birthday sleepover. Since we were 8th graders we handed out programs and were errand monkeys for the 9th grade graduation. Afterward everyone came back to the house to .... drink out of baby bottles yet again. I am wearing a negligee. 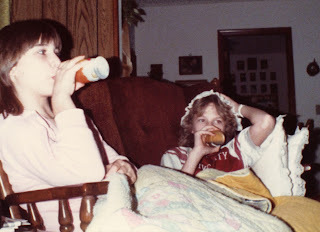 This is DeLisa and me at a sleepover at Stace's. 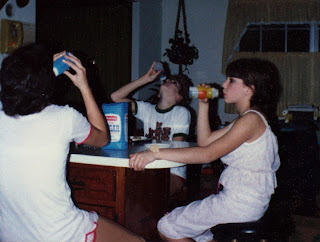 This was an epic sleepover because her parents had a travel trailer that we hung out in until the lack of air conditioning ran us to the house. 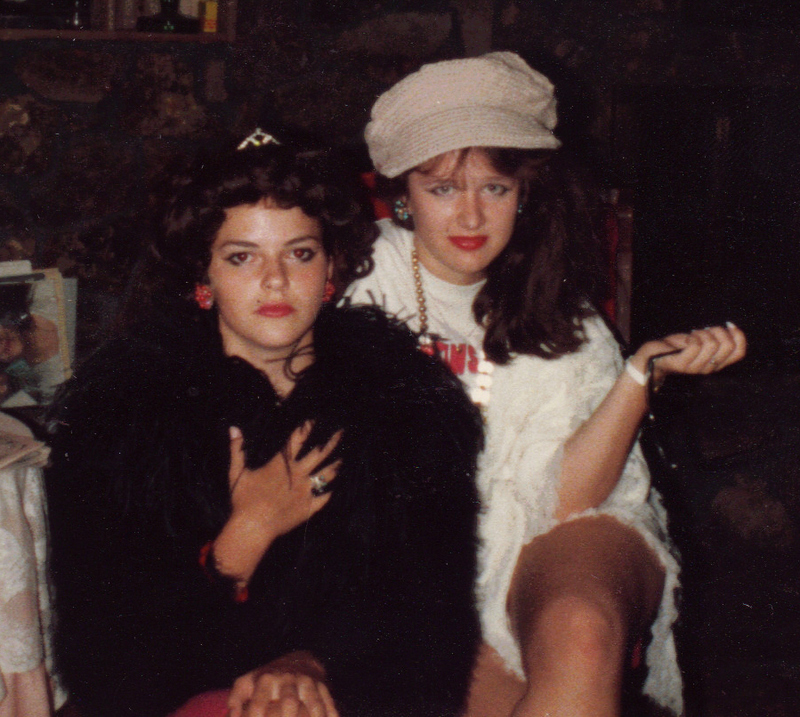 Then, because Stace's mom is a hair stylist, she had wigs and all sorts of fabulous makeup. And mega cool hats and furs. Soooo....De and I dressed up as hookers. Who knows why we posed for this picture my keyboard? Who really knows. DeLisa's angsty rocker look and clenched fist, though, is utterly priceless. 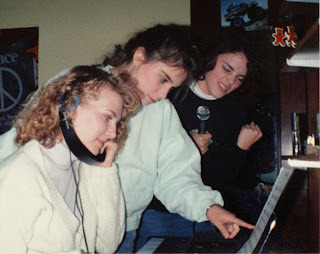 This wasn't my birthday, but apparently a spontaneous rock band practice. Or something. This wasn't my birthday party in 1989, but one for the foreign exchange student (far left) we were hosting that year. Notice the lack of baby bottles. Duh. There were upper classmen there. Gah. 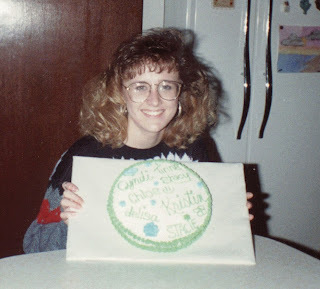 This is 1990, my 17th birthday. My mom entered a contest in order to win a "Maalox Moment" t-shirt for me. 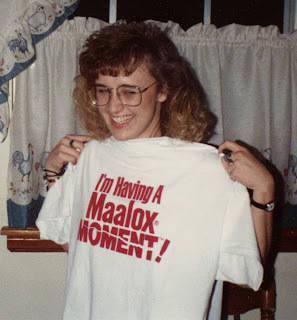 I used to say "I'm having a Maalox moment!" all the time, so again, coolness points for my mom. We just happened to be in the cake decorating chapter in Home Ec, so that year I made my own birthday cake. Note the wideness of my hair: it is almost as wide as my shoulders. 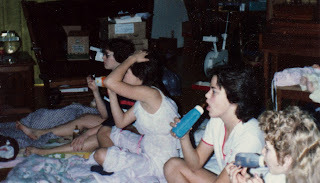 Thank Heaven for Aqua Net. ﻿This is the party we broke out the video camera and did an episode of "Wilma's World", our version of Wayne's World. 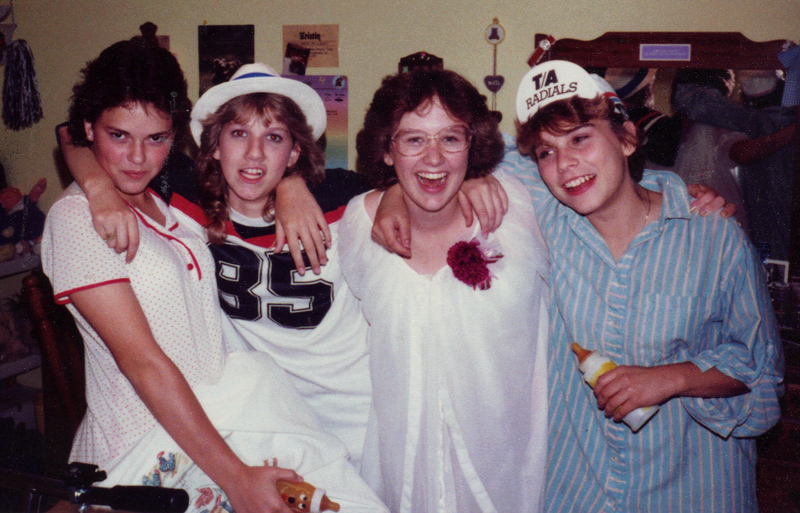 Stace (far left) was a "slutty cheerleader" and her answers to Wilma's questions were HILARIOUS. I was sitting next to her with the hat on my head. I was Mrs. Tukwilla, a hairpiece sculptor. My character was taken off of SNL and a skit where John Malkovich was on a talk show as Len Tukwilla, driftwood sculptor. Sitting next to me was our foreign exchange student who was Miss America. She wore a bathrobe and the Belgium and US flag stuck in her headband. On the far right was Cyndi who played Wilma. She strummed the guitar and interviewed us all, randomly shouting "EXTREME CLOSEUP" and other random phrases through the show. Later that night Stacie taught us a cheerleading routine then we all stuffed blankets and pillows in our shirts and acted out a workout video. She was the peppy instructor cheering us on to victory, but as soon as she turned her back to us fat girls doing the workout, we grabbed cake and chips and stuffed our faces while she danced and sweated. I'm not celebrating this year's birthday with a sleepover, but instead Paul and I are going to see The Green Hornet and hopefully True Grit. Sans kids. Hopefully there will also be a steak dinner involved. 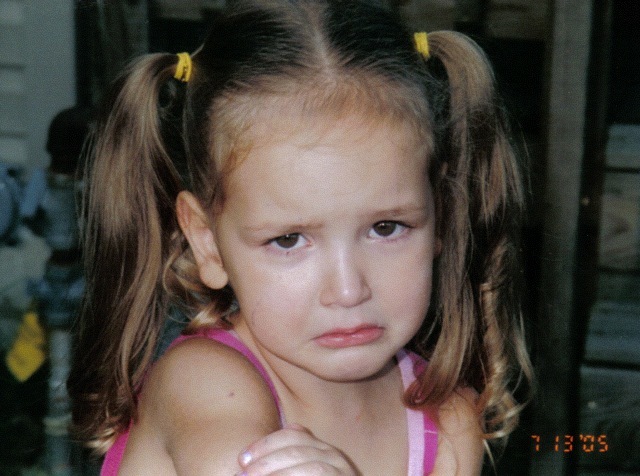 The day after Abby got bit by The Spider from Hades, as we so affectionately call it, I got sick with a sinus-y, cold type affliction that made me run a fever, which made my skin hurt, which made me whiny, which made my husband banish me to the bedroom. I was in bed by 8:00 that night, shivering under about six blankets, wearing sweats and a sweatshirt. I'd have worn a sock hat, too, had I remembered it before I got in bed, but as it was I wasn't getting out from under those covers unless I had to pee and I was going to have to be at emergency level then. 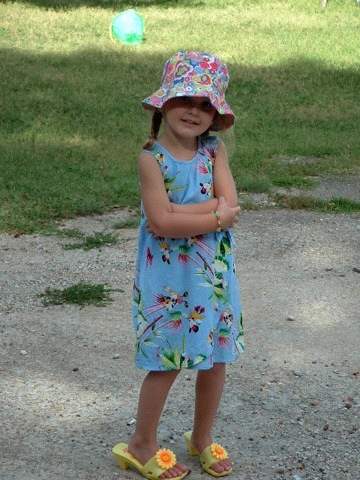 Abby was still feverish from the bite, had a horrific headache and her joints hurt. Even though I was at Death's door (ha.) I had her sleep with me that night so I could keep an eye on her. She was watching TV while I laid under my mountain of blankets, occasionally whining or moaning just so the world would know I was still alive, when my phone rang. It was my momma. I answered with a pitiful, "*sniff sniff cough* hello?" and was greeted immediately by both parents going, "Awwwwwwwwwwww! Poor baby!" I guess the text I had sent about an hour prior to their call worked in letting them know I needed sympathy. After I was properly babied Mom then proceded to tell me about a thing she read online where this doctor was tasering spider bites and having amazing results with it. I'll be honest, my initial reaction was that there was no way in hecky darn I was going to have my daughter tasered. I mean, we try to reserve that for bad grades and overages on cell phone minutes. I thanked Mom for the research but in my mind I dismissed it due to the extremeism of the whole ideal. When Abby asked what she wanted I non-chalantly said, "Oh, Gram heard about a doctor who tasers bite victims and thought it might work for you." Her eyes got big as dinner plates and she sat straight up in my bed and said, "You grownups are smoking dope if you think I'm gonna let you TASER ME!" I laughed and assured her there would be no tasering. As long as she kept her grades up. Fast forward one week to when my daughter then had TWO! BLACK! SPOTS! on her leg at the site of the bite, the red area around it was increasing and it just generally looked bad. I Facebooked that it wasn't healing and sent the same message to Twitter. Within a few minutes a gal from OKC tweeted back and asked for my email address because she wanted to share something with me about a guaranteed (!) remedy. I happily sent it on because I was at the point where I was going to believe in unicorns and husbands who don't leave their short little shaved whiskers all over the bathroom counter providing someone used the word "guaranteed" when they mentioned them to me. She emailed me about the doctor in the practice she works in who is shocking spider bites and having 100% positive reactions to the therapy. Most within 24 hours from what I gathered. When Paul got home that night I had already prepared a speech for him about why we needed to pull her out of school and make a trip to the City to let a doctor essentially taser our daughter for the sake of healing up the cavernous rotting hole in her leg. He listened and kind of grinned. I only hoped the grinning meant he was on board for a trip to the City for tasering and a visit with my sister and her husband. But no, instead he just spit in his spit cup and said, "You know we've got a shocker thing here at home, right?" And it hit me - his mom was on a herbal/homeopathic/alternative medicine kick a few years back and after I made him quit chelation therapy because it made him smell like creamed corn, she bought him the shocker thing for here at home. It's supposed to balance the body, remove heavy metals, kill germs, bacteria, viruses, worms, parasites, bring Mars out of retrograde, allow Roscoe P. Coltrane to finally catch those Duke boys for good and rid the world of jeggings once and for all (and I'm pretty sure the informational flyer also said cure cancer, but I wasn't quite believing that claim) (the jeggings we can only hope) all from the comfort and privacy of your own home. But all I could think was THIS THING IS CAPABLE OF SHOCKING! HERE AT HOME! SHOCKING! IN OUR LIVING ROOM! and while I miss my sister desperately, I just kept thinking it was going to save us a lot of money on gas, food and an out-of-pocket doctor visit if it actually worked. And then we had to get Abby on board the whole shocking issue. Fortunately, she is 14 and all I had to do was explain that a little minor discomfort while being shocked was better than PERMANENT! DISFIGURATION! via the rotting holes in her leg. She hitched up her pant leg, flopped down across the chair and said, "Let's get this over with. I want to wear shorts again someday." From what I've read, if you get shocked or tasered in a medical office it's one big whopper of a shock and it's done and within 24 hours you see dramatic results. Since the shocker we have here at home isn't quite that powerful, we've been administering the electricity to the area around the bite for 10-15 minutes at a time and we've been doing it since Friday. The redness is going away and the skin has a generally just better appearance all around. I don't think it's coincidence, considering these bites take so long to heal - it's not like we just happened to start shocking when the bite was already healing. I honestly think there is really something to it. And on the positive side, Abby can make a grilled cheese sandwich in her bare hands now. I know y'all are probably a bit disappointed that here I've taken all these months away from the blog only to come back now and every stinkin' one is about this spider bite, but just hang with me. I have the worst case of writer's block right now (and have for awhile) and I'm slowly breaking through. Right now I'm baby-stepping back into it and unfortunately, you get to read about The Great Spider Adventure of 2011.